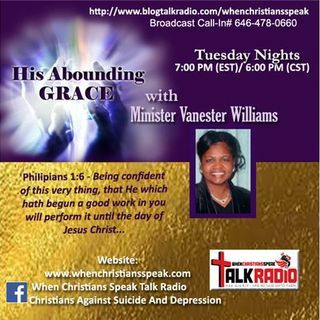 de When Christians Speak Inc.
WEEKLY BROADCASTS: When Christians Speak Talk Radio Broadcasts -“"His Abounding Grace Broadcast" with Minister Vanester Williams - Tuesdays @ 7:00 pm; "Declaring The Finished Work with Rev. Pat Randall" - Thursdays @ 12:00 Noon; "Friday Night Joy with Rev. Ray and Friends" - Fridays @ 7:00 pm; "Bread of Life with Rev. Ray" - Sundays @ 7:00 pm, "Challenged To Change with Pastor Paul Morgan" -Wednesday @ 7pm; MONTHLY BROADCASTS: "Lifeline ... Más informaciones with Apostle Shirley Jones- Every 1st Monday @ 7 pm; ‘The Bold and Beautiful with Rev. Novena Reed, Rev. Curtis Alston, and Min. Jordana Cunningham - every 2 Saturday @ 10am.’ "ADORATION with Evangelist Lewis McILwain, - every 3rd Monday of the month. Marriage Takeover: The Body of One. With Rev. Eric and Rev. Temeka Thompson every 3rd Sunday @7pm. R3 REAL LIFE; REAL MEN; AND REAL TALK with Ray Rose, Elston Green, Cleophas Malone, and Antonio Mitchell: every 3rd Sunday @7pm WEEKLYPRAYER: "Mid-Day Glory Prayer with Rev. Gwendolyn Dixon"-Every Wednesday @ 1pm Dial-in Number:(641) 715-3580 Access Code:732-499 PIN.